We have crystals lying about, but don’t know whether these are still working all right. The crystal tester described here will quickly show whether a crystal can be used or should be discarded. Transistor Q1 and the crystal under test from an oscillator. Capacitors C1 and C2 form a voltage divider in the oscillator circuit. If the crystal is in good order, the oscillator will work. Its output voltage is then rectified and smoothed by D1 and C4 respectively. 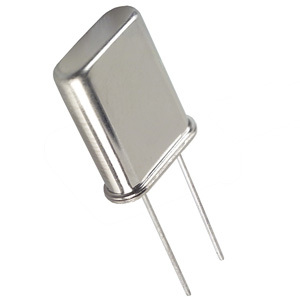 The resulting direct voltage at the base of Q2 is sufficient to switch this transistor on, so that the LED lights. 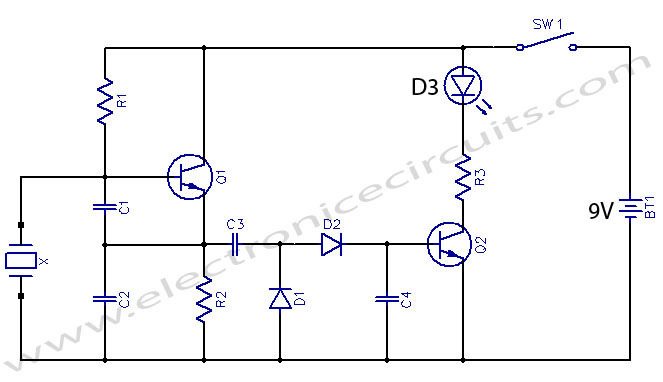 The circuit is suitable for use with crystals of a frequency between 100kHz and 30MHz. Current consumption is about 50mA. I have built this circuit and it works great.